Adobe has launched Photoshop CS5 and Photoshop CS5 Extended, its flagship image editing and compositing programs. Both versions are packed with new features and technology improvements. Photoshop CS5 Extended offers everything in Photoshop CS5, but adds advanced tools for artists working with 3D or motion-based content. Among the major updates are features such as Content-Aware Fill, Puppet Warp, and HDR Pro and HDR Toning. There are also new painting effects, a new version of the Camera Raw plug-in, automated lens correction, flexible custom panels, a new workspace switcher, and more. Technology advances include new GPU-accelerated features, faster performance with 64-bit support, and improvements to the OpenGL engine. The new version of Photoshop also offers enhanced media management and Web Gallery integration with Adobe Bridge CS5 and the new Adobe Mini Bridge, both included in the program. Streamlined creative reviews are now available through integration with Adobe CS Review, part of Adobe’s new CS Live online services. 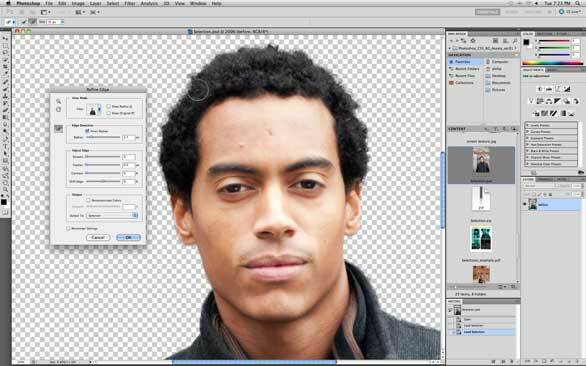 With the new version of Photoshop, Adobe revisits the Refine Edge dialog and adds new functionality to it. Intelligent selection technology offers better edge detection and faster, more accurate masking results with complex subjects. Automatic color decontamination helps eliminate background color around the edges of a selection. Photoshop CS5's edge detection and decontaminate colors features help you make precise selections of complex subjects, enabling faster, more accurate compositing of multiple images. Photoshop CS5 introduces the new Content-Aware Fill feature that lets you remove an image element and replace it with details that match the lighting, tone, and noise of the surrounding area so that it looks like the object never existed. New in Photoshop CS5 is HDR Pro, a feature that gives you more control over the HDR merging process and greater adjustment power over the mapping of tones and the styling of HDR output. You can even create the look of an HDR-processed image from a single photo with the new HDR Toning feature. The new Camera Raw 6 plug-in supports more than 275 camera models. The utility provides advanced, nondestructive image editing and enhancement for raw files, and other standard formats, including JPEG and TIFF. The updated plug-in lets you remove noise, achieve better quality sharpening, apply new styles of vignettes and film-like grain, and shoot at higher ISO settings. Photoshop CS5 offers new painting options with the new Mixer Brush and Bristle Tips features. The Mixer Brush lets you define multiple colors on a single tip, and then mix and blend them with the underlying hues on your canvas. Bristle Tips let you control brush stroke characteristics. The Puppet Warp feature allows precise repositioning of any element within a document or selection. After repositioning an object, Photoshop adjusts the rest of the image. New Lens Correction features create better quality captures by removing or correcting the three most common lens-based errors: geometric distortion, chromatic aberration, and vignetting. With the aid of a downloadable panel utility, you can create your own panels of favorite tools, menu selections, and more. The new Live Workspaces feature auto-saves changes you make to a task-specific workspace, while the Workspace Switcher lets you arrange and navigate your workspaces. Photoshop CS5 is $699, with an upgrade price of $199. It's also available with the Design Standard Edition. Photoshop CS5 Extended has all the features of the standard version, but caters to artists working in 3D. Adobe Repoussé technology lets users create 3D logos and artwork from any text layer, shape, or mask, as well as twist, rotate, and extrude designs. A new library of materials offers a large selection of surfaces and textures. An improved Adobe Ray Tracer (ART 2.0) engine in Photoshop CS5 Extended offers performance improvements when you interact with and edit 3D models. Photoshop CS5 Extended is $999, with an upgrade price of $349. It is part of the Design Premium, Web Premium, Production Premium, and Master Collection. It runs on OS X 10.5.7 or 10.6. Adobe has made numerous changes to its Bridge file management utility with the launch of CS5. Updates include flexible batch renaming, including find and replace; text- and image-based watermark options when exporting PDF documents; faster navigation between open folders with an improved Path bar; precise adjustment of the size and quality of images, ability to display filenames, and save templates within the Web Gallery; drag and drop to place files into InDesign, Flash, Illustrator, and Photoshop; and more. You can now access media with a panel version of Bridge, called Mini Bridge, directly within Photoshop. Bridge CS5 ships with all applications and bundles. Mini Bridge is available in both versions of Photoshop and in InDesign CS5. 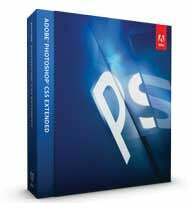 Both Photoshop CS5 versions ship within 30 days.